REBOUNDERS SHIP FAST & FREE! This procedure will destroy the old jump mat. If you wish to save it, please review the Spring Removal Instructions. Position the rebounder on the floor or a table with legs extended. 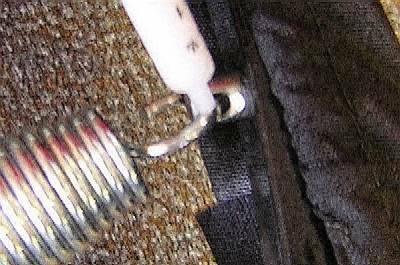 To gain access to the springs and edges of the mat, you must remove the spring cover from the rebounder. This is done by pulling the “bungee” cord over each leg. 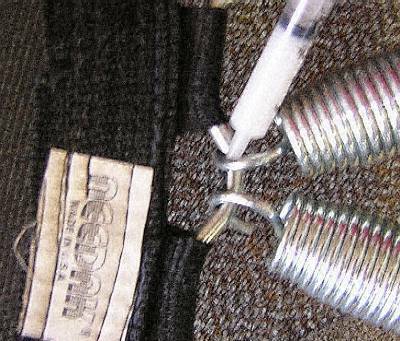 Or, you can carefully pull the spring cover over the frame and slide it down the legs. With the mat fully exposed, you will remove the old mat with a scissors or utility knife. 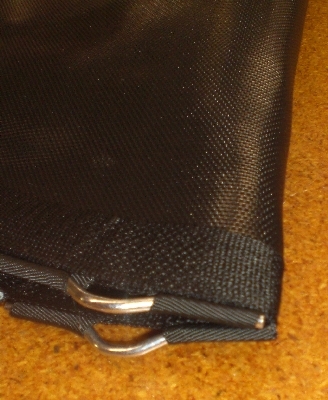 The polypropylene material used for the jump surface and the edge webbing are very tough. Be cautious of your cutting tool and remain in control during the cut. Begin by cutting from the center of the mat toward and through the outer webbing. Repeat this as many times as necessary to remove the mat. With the mat now removed, inspect the clevis pins that pass through the frame for excessive wear on the eye of the pin. 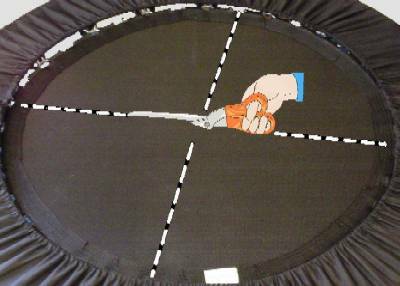 In order for the rebounder to properly close, the grain of the mat must be in line with the hinges. At left is an example of the weave of permatron. The fibers are crossed to form 2 perpendicular axes. The grain is either set of fibers. 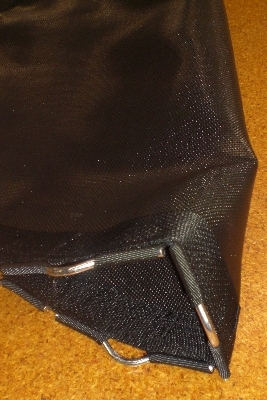 The grain of the mat passes between 2 cleats which will attach between the 2 hinges of the rebounder. The negative grain will pass directly into 2 mat cleats. Finally, lubricate the contact points between the springs and mat cleats and if necessary the point where the springs enter the Clevis Pins and replace the spring cover. Copyright 2012 NeedakRebounder.com. All Rights Reserved. This website is owned and operated by an Authorized Retailer of Needak rebounders. Needak Manufacturing shares no ownership interest in this website and has no responsibility or control over content, opinions, or healthcare advice presented or any financial or personal data collected through this website. Needak is a registered Trademark of Needak Manufacturing, LLC O'Neill, NE USA."